The fight against mosquito-borne diseases in Singapore has been going on for decades. Before Zika became a household term, Singaporeans had to deal with the threat of dengue hemorrhagic fever. The Aedes aegypti mosquito – which carries the dengue virus – can lay its eggs and breed in even the smallest pools of stagnant water. Singapore’s dense urban landscape complicates mosquito eradication efforts by exposing numerous roofs and gutters that collect rainwater and turn into potential breeding zones. 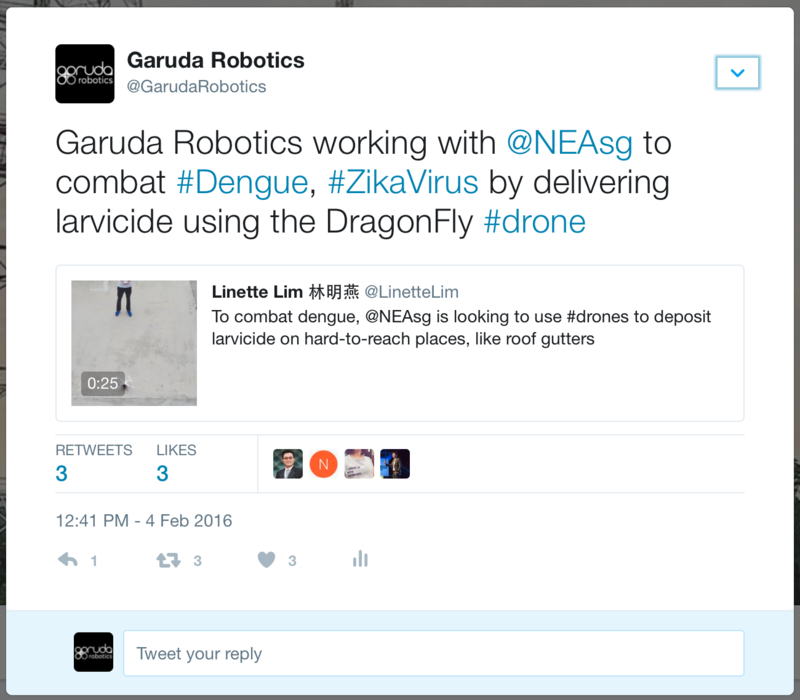 The Garuda DragonFly UAV system is the result of a collaboration betwen the National Environment Agency (NEA) and Garuda Robotics to build new weapons for the fight against dengue and Zika. With the DragonFly UAV, NEA enforcement officers can quickly, safely and efficiently scan hard-to-reach areas for stagnant water and immediately deliver larvicide tablets into those pools – right into the heart of the mosquitoes’ breeding zones. The larvicide tablets dissolve gradually and kill mosquito larvae as they do so, interrupting the breeding cycle and reducing the population of the primary transmission vector for dengue and Zika fevers. Mosquito-borne diseases are a perennial problem in Singapore. Dengue hemorrhagic fever was a major public health issue long before Zika hit the news. Singapore’s rainy and warm climate allows mosquitoes to breed all year round, while also speeding up their breeding and maturation cycles. 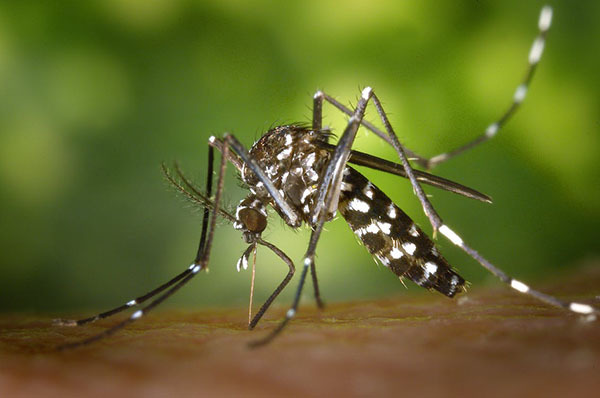 Of the different mosquito species, eradication efforts here have focused on the Aedes aegypti mosquito which carries the dengue and Zika viruses. Aedes aegypti is particularly difficult to eradicate as it requires very little stagnant water to breed. Able to lay eggs in small man-made containers, producing about 100 eggs each time, it can even breed in stagnant water found in crevices of trees. The eggs can also lie dormant for up to nine months in dry conditions, hatching afterwards if exposed to favourable conditions. In Singapore, the National Environment Agency (NEA) is responsible for combating mosquito-borne diseases such as dengue and Zika fevers. Preventing mosquito breeding remains a cornerstone of their efforts. NEA enforcement officers regularly inspect homes, businesses, parks, construction sites and other areas in a search for stagnant water where mosquitoes can lay their eggs. When a sufficiently large pool of stagnant water is discovered, NEA officers deposit a tablet of BTI larvicide into the pool. BTI – Bacillus thuringiensis subspecies israelensis – is a bacterium that has been used successfully worldwide since 1982 as a biological pest control agent to combat mosquitoes by killing them in the larval stage. The difficulty, in Singapore’s dense urban landscape, is getting access to the pools of stagnant water that accumulate in hard-to-reach areas – on rooftops or in gutters. Unmanned Aerial Vehicles (UAVs) or drones were an obvious solution to this problem. Our initial discussions with NEA took place in May 2015, when dengue fever was still the primary mosquito-borne disease being targeted. By end 2015, the potential threat posed by Zika fever had come to the fore, and the need for a UAV solution to deliver BTI tablets to rooftop and gutter pools of stagnant water had become increasingly urgent. 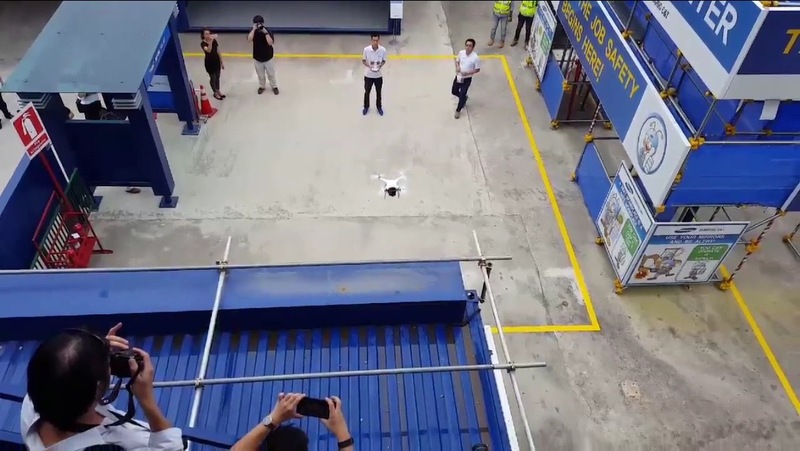 By January 2016, our Engineering team built and demonstrated a prototype UAV solution capable of accurate delivery of a BTI tablet to a distant location. Based on this prototype, we were awarded a contract by NEA to complete the development of the first generation of the Garuda DragonFly UAV system. Naming the UAV system was a surprisingly easy task: Dragonfly nymphs are voracious carnivores and eat, among other things, mosquito larvae – just as the Garuda DragonFly UAV system is designed to target mosquito larvae in their breeding environments. UAVs are complex machines, and the process of training a pilot to be a safe, reliable and skilled operator is an intensive one. How do you build a BTI delivery UAV system that is stable in flight, intuitive to use and capable of withstanding the rigors of daily operation under harsh conditions? We were also dealing with a small window for R&D, given the urgent need for the UAV system. With limited time available, multiple designs were evaluated in parallel and rapidly prototyped and tested until we converged upon the final version. The key considerations for us were the user interface and the ergonomics of the physical devices, especially the handheld controller. NEA has developed their field protocols around the use of 60mm-diameter tablets of granulated BTI (as opposed to loose granules), so the payload bay was designed to hold just one such tablet at a time. We realized the importance of placing a targeting assistance marker on the screen of the mobile device used for viewing the live video feed. This would allow the pilot to focus on maneuvering the UAV so that the targeting marker is placed over the drop zone. When the release trigger is activated at this point, the BTI tablet will be accurately delivered to the intended target. 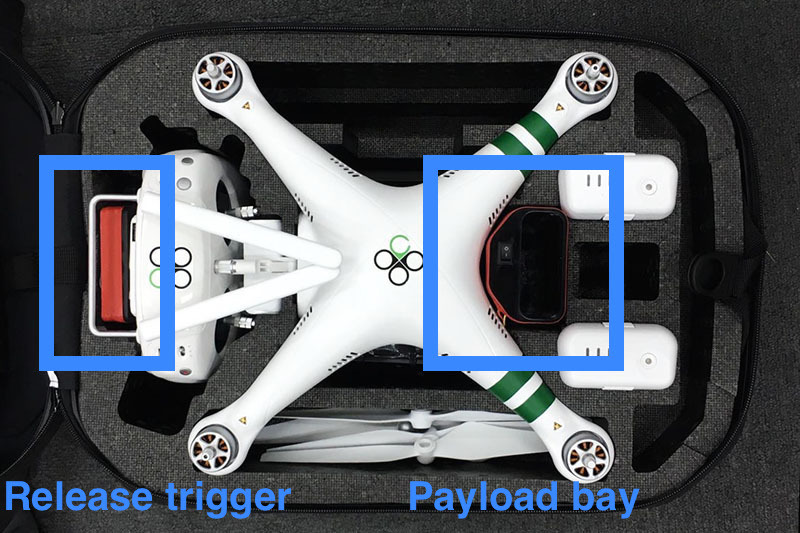 Through live release tests, we validated our calculations and the accuracy of the payload targeting and release mechanism. To prevent an accidental payload release from taking place, multiple safety interlocks were designed into the release trigger that we retrofitted onto the handheld controller. The DragonFly UAV system had to be built to stand up to intensive field usage, reliably delivering its payload multiple times a day, 365 days a year, rain or shine. The entire system had to fit into a man-packable case to support single-operator deployments – all spare parts, additional batteries and required components had to fit into this backpack. A difficult challenge – but our Engineering and Operations teams were up to the task. An outbreak of Zika fever that started in Brazil begins to spread to other parts of South and North America. 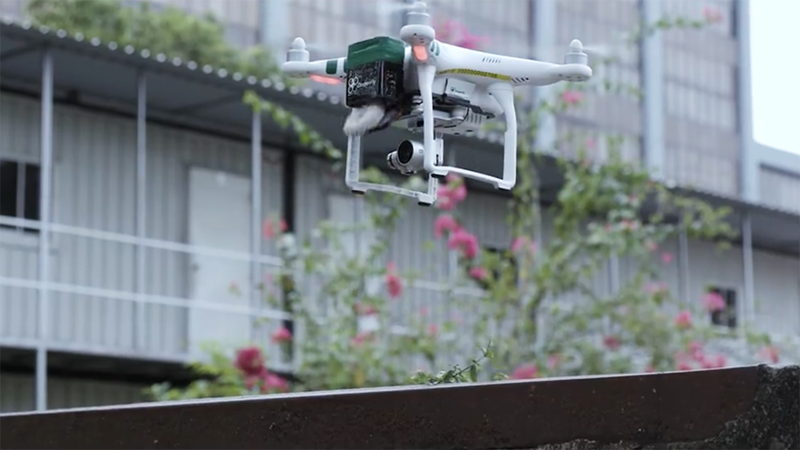 The National Environment Agency (NEA) in Singapore solicits proposals for a UAV that can deliver a tablet of BTI larvicide (Bacillus thuringiensis serotype israelensis). After a successful field demonstration of a prototype, Garuda Robotics wins a contract to further develop and produce the DragonFly UAV system. In the face of mounting evidence that Zika can cause birth defects and neurological problems, the World Health Organization declares Zika a Public Health Emergency of International Concern. Garuda Robotics demonstrates the DragonFly UAV system in action at a Ministry of Transport UAS media event. Garuda DragonFly enters field trials with NEA enforcement officers, thus arming NEA officers with a new tool in the fight against dengue, Zika and other mosquito-borne diseases. Before it went into service with NEA enforcement officers, Garuda DragonFly was unveiled to the public at a media event organized by the Ministry of Transport, Singapore. Attendees included Mr Pang Kin Keong, Permanent Secretary of the Ministry of Transport, representatives of the National Environment Agency, and members of the media. The media event was held at a live construction site, where several pools of water could be seen on the rooftops of the temporary container structures. 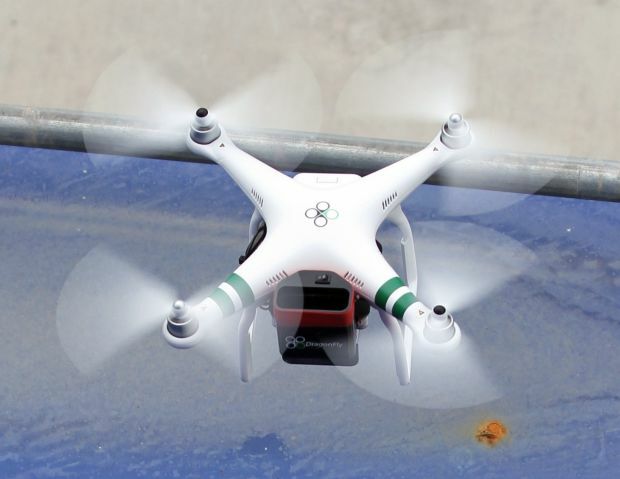 During the live demonstration of the DragonFly UAV system, a BTI tablet was dropped right in the middle of the target pool of water. In a live deployment scenario, the BTI tablet would be left to dissolve slowly over the next two weeks, creating a protective shield against mosquito breeding in that pool of water by killing any larvae within. We want to try to facilitate and encourage the use of drones in order to improve the efficiency and effectiveness of operations, both at the public and private sectors. 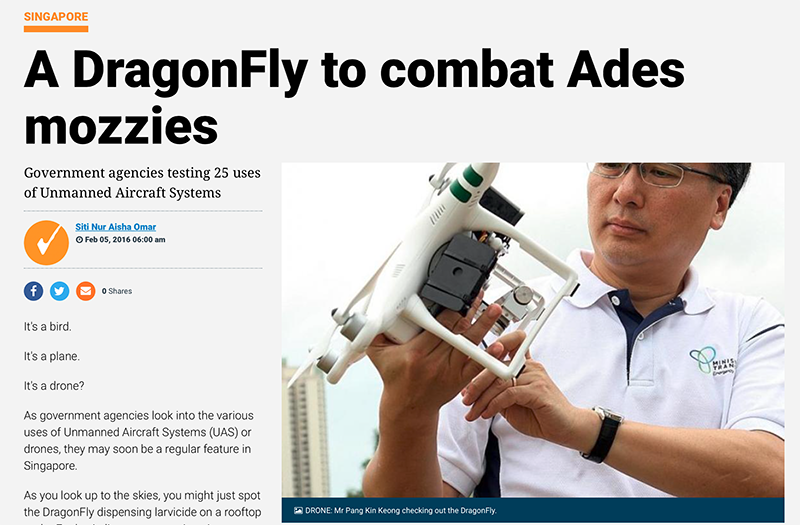 DragonFly is now used by NEA officers in the field, scanning rooftops and gutters for stagnant water pools and delivering a deadly blow to mosquito larvae where they are found. The improvements in safety and efficiency are obvious – no more climbing up to rooftops, and no more throwing of BTI tablets into water pools. We designed DragonFly to carry out its job accurately and reliably, and that’s what it does every day, with every flight and every delivery. As NEA’s enforcement officers continue to use DragonFly in the field, they accumulate valuable operating experience which our engineers use to plan for future revisions of the system. The first generation of DragonFly was designed to solve an urgent problem. More importantly, it made the discussion around the use of UAVs in environmental monitoring and enforcement more tangible. More recently, Garuda DragonFly was featured in a film presented by NEA at the 2017 Ministry of Environment and Water Resources (MEWR) Workplan Seminar. 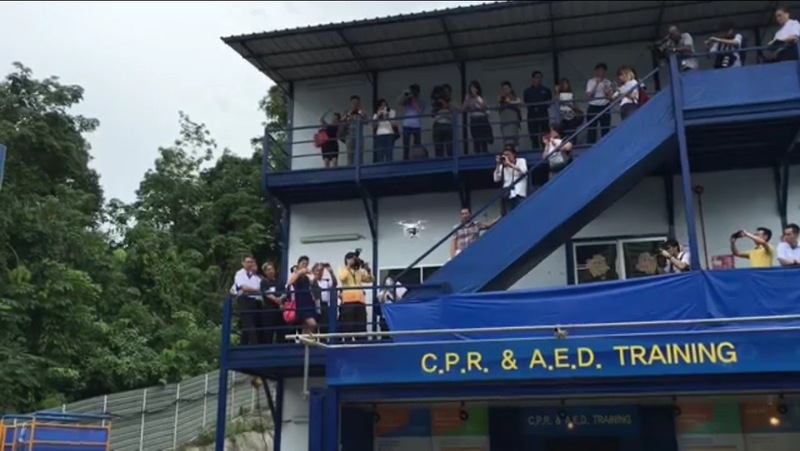 One day soon, UAVs will be a part of the standard field kit issued to all NEA officers tasked with monitoring our physical environment and keeping us safe from dengue, Zika and other mosquito-borne diseases. Garuda DragonFly is just the first step in the journey towards that goal. The development of new technologies and solutions does not stop. 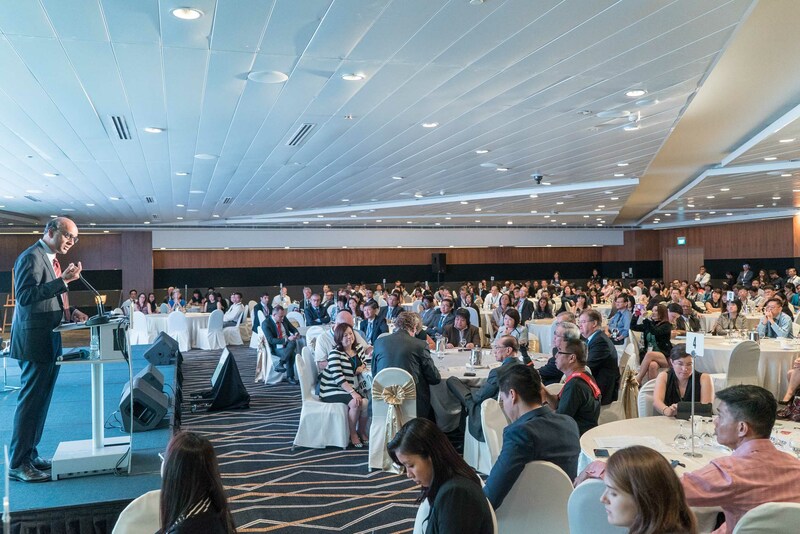 As a Singapore-based company, we are proud to have played a part in tackling a very real problem with a national impact.